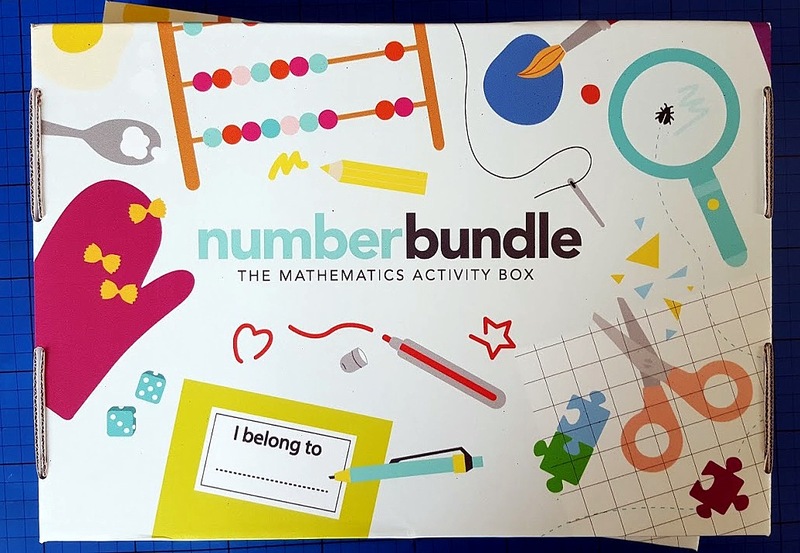 Numberbundles are 'mathematical activity boxes supporting the Early Years Foundation Stage and National Curriculum for children aged 3-7'. The boxes are sent out to subscribers on a monthly basis although you can buy them individually, and each one contains different activities around a common theme. Children use the box with their adult, because learning together teaches everyone so much more than working alone. 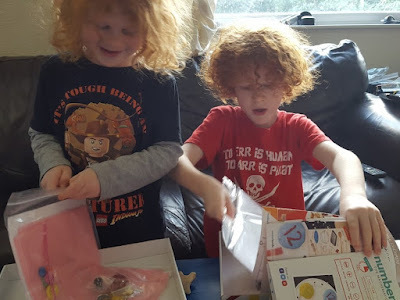 My young boys are 5 and 7, and we have been sent a couple of the Numberbundle boxes released recently to review. My 5 year old has been sent a box with the theme of Money, which ties in with what he's up to at school in Year 1. There are 7 different activities including an easy recipe, a 'shop', playing with coins and familiarising yourself with them, cleaning coins with science, a craft activity and counting activities. My son was incredibly excited by the play money and keen to find out what all of the activities were. Almost immediately he decided we didn't have enough 1p's and I added a handful of small change, which he continued to play with all afternoon. The pack has definitely increased my son's understanding of money. He didn't view any of the activities we tried as 'work' - which he refuses to do out of school. It was definitely play, initiated by him, and he enjoyed it. The variation in activities means that although my son doesn't currently want to participate in craft, he still has plenty to try. My 7 year old has been sent a box with the theme of Time. This was the box for children in Year 2, aged 6-7. 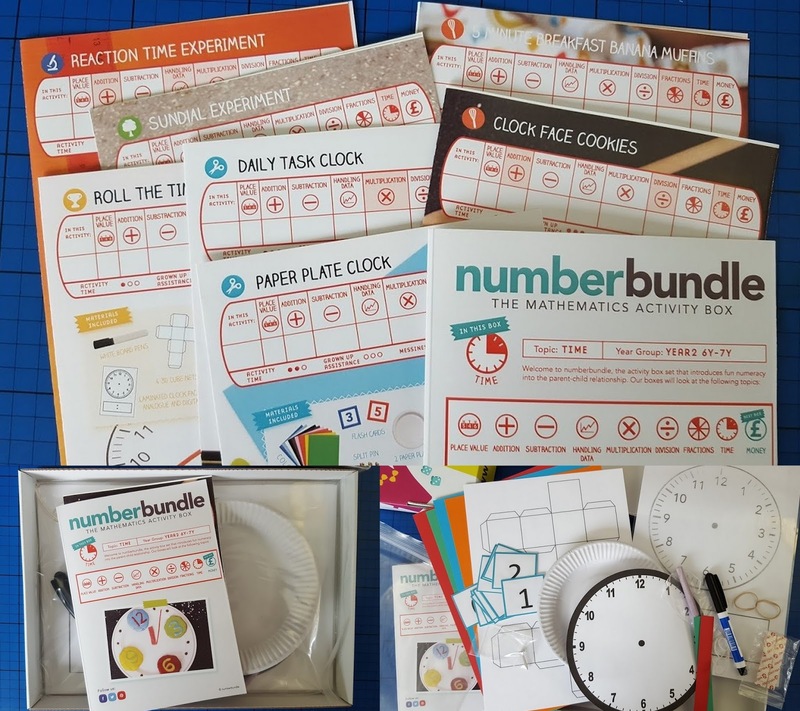 Again 7 activities, this time with a larger variety of really nicely prepared resources - laminated cards and clock faces etc. 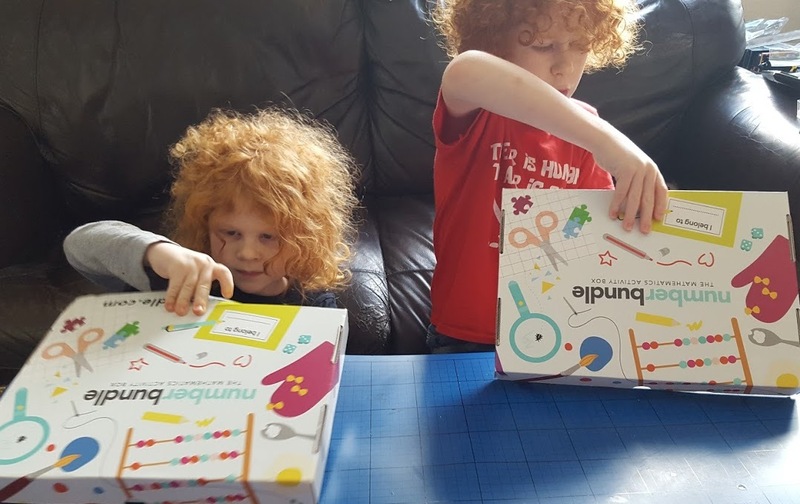 As with his younger brother's pack, his activities included a simple recipe, a science based activity and craft activity. My son is just learning to tell the time at school, so this is perfect. By playing with clock faces he has really grasped the concept of the circle being in quarters, and having a 'half past' and we were able to take pride in that together. He loves craft and spent hours cutting very carefully to make our own cubes (dice) from sheets of stiff paper. 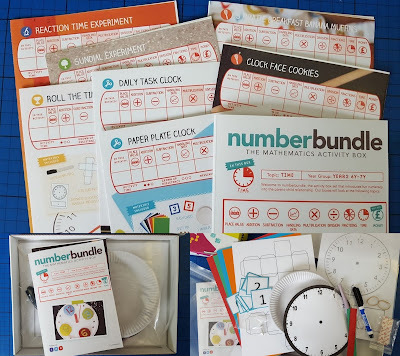 As someone who has written and delivered teaching and training courses I can see the work that has gone into each Numberbundle to make it interesting and exciting and varied. There is something for everyone, and it's all fun, so children don't realise that they're learning, and they learn so much more. 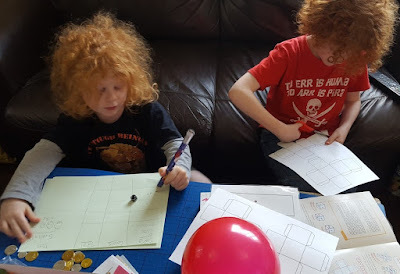 The supporting paperwork is really easy to understand and gives the adults a good idea of exactly what their child is learning through the activities, and where it fits in with their schoolwork. There is always room to expand on the games and activities, or adapt them to suit your own preferences, but we found the activities perfectly suited to the boy's ages. 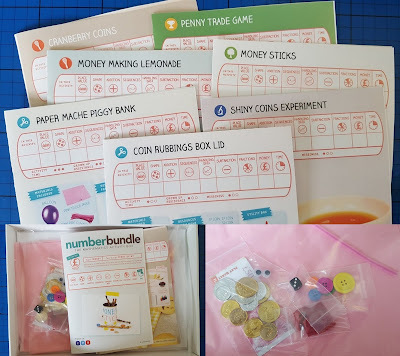 A Numberbundle subscription costs £16.99/month + £2.80 UK postage (international postage is available), opt out at any time. 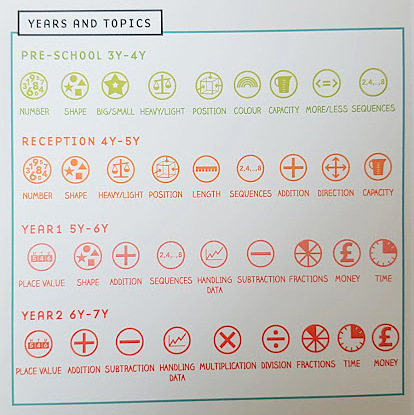 There are 4 different Numberbundle age ranges, corresponding with Preschool, Reception, Year 1 and Year 2 (age 3-7). Each box has a theme and is put together by hand to order. Numberbundle very kindly offered a Numberbundle box as a giveaway prize for one of my readers. The giveaway is over. I liked English because we did a lot of reading. I liked maths because i found it logical and i liked there was a correct answer! My favourite subject was art, i loved to draw. I really liked History. Just learning about how life was lived in the past. I loved Maths, I have a very logical mind! My favourite subject was science because we got to do lots of cool experiments and play with fire. It certainly wasn't maths as I struggled with it once we got past 'big divisions.' Shame these boxes weren't available then. I actually loved history because I was fascinated by the repetitive and unwise nature of human behaviour. I enjoyed maths I find a safety in numbers they never let you down. I actually enjoyed most subjects apart from Maths as back in the day it was very boring, but now I think learning it in a more fun way is really good. My fave subject was P.E. I loved Maths as I like a challenge!! Reading - loved reading and still do. I loved English because I like to read. I loved history, it was so interesting. I liked learning languages, I liked the puzzle of it, creating sentences and translating, rather than speaking them. I liked Maths and i still do! I always loved maths, I think it was because it was one of the few things I understood! I loved history learning about Kings and Queens. I liked science at school, I just found it fascinating. I liked science because I loved finding out how things worked. English was my favourite subject because my love of books was immense so English was the subject I enjoyed the most. History because I found it easy and interesting to learn about the past. I loved English because I was introduced to many books I would have missed enjoying reading. I loved Maths - i don't know why, but I just love/d solving problems. I loved drawing and art but I didn't get to do very much of it. English because I've always had a big imagination! My favourite subject was art as i loved to draw animals, I havent done any drawing since I left school a number of years ago now, due to being so busy with other things. At primary school it was history, we did a big topic on the Victorians and it really fuelled my enthusiasm to find out more! Loved English and Art - was useless at Art but my teacher encouraged me rather than told me I was "useless". Loved English until the final month when I was told I should have been in the class above as I found it too easy (going back years when you were in "sets"). I loved English as I am a big reader! I loved Religious Studies because half of the syllabus was on ethics and we had brilliant debates on subjects like euthanasia, abortion and the like. My favorite subject was Art because I got to be creative.